Archive by category "Nature Farming"
Introducing my new line of Fairy Garden Accessories – all handmade and one-of-a-kind artwork to complement your fairy garden terrariums! Fairy Gardens have been a mainstay for the Wild Ozark market booth this season. Now I’m starting to make accessories to go with fairy gardens for the people who like to create their own terrariums and fairy garden scenes. All of my fairy garden accessories are one-of-a-kind. This means I’m making each one by hand and I’m not simply painting a resin mold-cast item. I gather the rocks from the creek here at Wild Ozark. If there’s a water feature, that’s made with a combination of hot glue gun and crayon shavings. Where a mossy look is added, it is actually powdered dried sassafras leaf or other green-colored herbs. Here’s the ones I’ll be bringing to market this week. These are ship-able, so I’ll add them to the online shop and Etsy if they don’t sell at market. The pool measures about an inch. I’m also working on some kits for those who want to build their own pools. Let me know if this is something that interests you. If I’m quick about it, I might have some of the kits with me at the market tomorrow, but I still have a lot of other things I need to do. Might be next weekend before I can put them together. These are about 2″ at the base and 2″ high. Want to See Them Early? 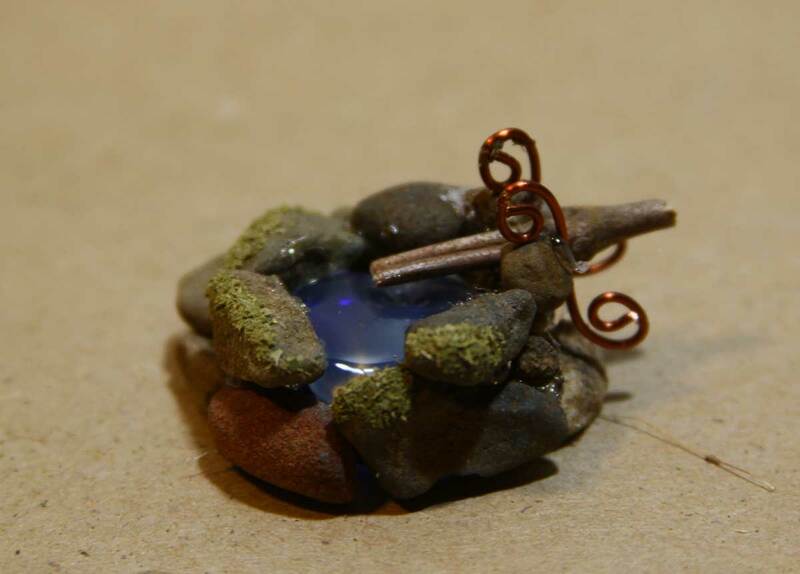 Watch for more fairy garden accessories as I get them created. Usually I share progress pics on my Instagram and Facebook, if you’d like to follow me there. If you’re in the northwest Arkansas area, you can see these at the market downtown on Saturdays and any I have left go with me for the day on Sunday at the Kingston Square Arts shop in Kingston, AR. 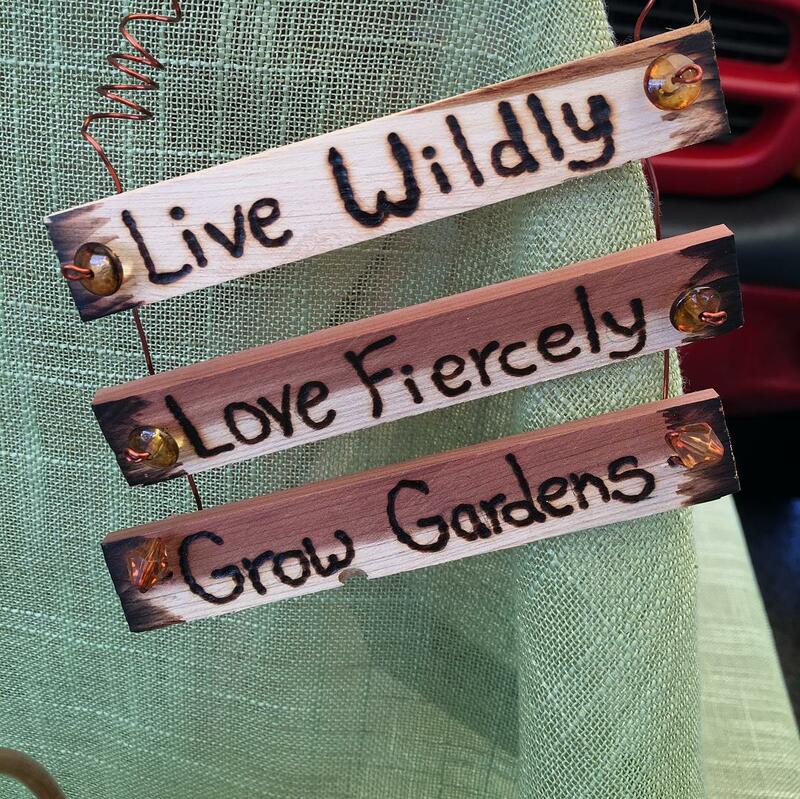 If you’ve bought one of my unique handmade items, send me a pic of your garden with it in there and I’ll share it to Instagram and FB! I’m just mired neck deep in a To-Do list of my own making, trying to get organized and into some sort of a groove now that market season has begun. Since I haven’t written in a while, I figured I’d write up a summary of a typical week at Wild Ozark. This is my first year at the Fayetteville Farmer’s Market and it’s a true test of my ability to maintain production of my creative arts. I’ve never had to continously make new product before, and I’m definitely not complaining. But it is a new thing to figure out. I want to keep making new things, but need to continue making the things I know will sell, and I need to still have some sort of life aside from the act of trying to keep up. The ‘some sort of life aside’ isn’t quite working out just yet, ha. I’ve been doing a lot of things. I have not been blogging; that’s obvious. It’s been more than a week since my last post here and that is not a normal occurrence for me. My first website and blog post was in August of 2001. At the time my website was called ‘Ancient Earth Wisdom’. I wish I had kept that domain, but I let it go long ago. That was back in the day of hand coding with HTML. There was no such thing as a blogging platform like WordPress then. You can still see the old site at the Wayback Machine. Did you know that the internet has an archive like that? Finally got the horses moved after weed-eating the fences for days. Lately I’ve had to squeeze time in for playing catch-up around the house. Spring took off with a fury and the weeds and grass grew up around the electric fences for the horses. Finally got that cleared. While out walking along the creek, I very nearly stepped on a rattlesnake. It’s been thirteen years since I moved here, and all those years I’m tromping around the woods and have never had such a near miss. 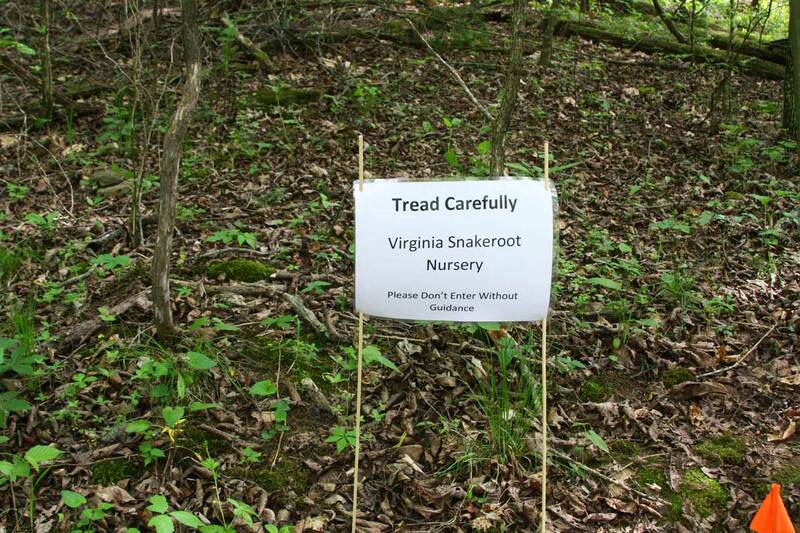 Yesterday I ordered some snake boots for future tromping. I haven’t been writing as much as I’d like to, but today I checked and saw that I sold 7 books! That’s more than I ordinarily sell in one day, ha, so it’s great news. Once market season starts, the entire week has a predictable pattern. On Mondays if I’m proactive about it, I start building my stock for the following weekend. The main sellers are fairy gardens, and I’ve been making some new things to decorate them, like little waterfalls and stairs. The Shagbark Hickory Syrup is also a good seller, but I still have to apply labels and shrink wrap, and pour up samples. So I try to get that done early in the week. On Monday if possible. Starting next week, Tuesdays are reserved for watching the grandkids. I’m looking forward to that, but I need to find a way to crunch everything else into the remaining days of the week. I’ve become a workaholic, so this break will be good for both me and the kids. Ordinarily I like to get the fairy gardens made on Wednesdays, and any ginseng seedlings that need to be potted done. This week, I went to the creek, watched better for snakes this time, and collected some gravel. I love the ones with red in them, but the Ozark creek gravel comes in all shapes and sizes and in lots of shades of colors. I’m using them to make the fairy garden accents. We have a lot of rocks here, so I’m happy to find ways to use them. And here’s what I did with the rocks. The ‘moss’ is ground sassafras leaves. The ‘water’ is hot glue. A ‘moss-covered’ waterfall for the fairy gardens. A set of ‘moss-covered’ steps for the fairy gardens. Here’s one of the finished fairy gardens with the steps added to it. Fairy garden with moss-covered steps. It’s the time of year when the ginseng seedlings are for sale, too. On Wednesday I try to get any seedlings that need to be potted done. They’re usually settled and ready to sell by Saturday, but the ones that are still not happy on Friday stay behind in the Recuperation Nursery Bed. By Thursday I’m starting to panic because I’m not ready yet. On Friday it’s a mad rush trying to finish up and then before dusk, pack up the truck. Saturday starts at 0300 when the alarm goes off and I moan and groan about getting up so early. By 0345-0400, I’m on the road to Fayetteville. On a good market day, I’m sold out of the fairy gardens by 11 am and most of the syrup samples are taken before then. For every two samples, I probably sell at least one bottle of syrup. On Sunday I work my shift at the new Kingston Square Arts shop. My Fairy Mushrooms and Forest Folk and books are there, so if you’re up for a nice day trip to the rural parts of our beautiful state, come to Kingston on a Sunday and say hello! Then it’s back to Monday again and the cycle starts all over. Notice I didn’t mention house or yard work much in my week. That has to be fitted in there somewhere, but it’s a struggle. If anything unexpected arises during the week, it throws the entire schedule off kilter. My kids don’t seem to understand that I’m not ‘retired’, so when I need to watch the grandkids unexpectedly, it creates havoc with the ‘work week’. But I like to try and keep them on Tuesdays when I can. They like to help with things like gathering moss and rocks for the fairy gardens, and they love to make mushrooms from the clay with me. So you might have a good idea of why I’m behind on blogging and newsletter writing now. Thank you for being out there, and thank you all who support me as an artist, writer, and person trying to make a living with my passions. Yep this was a long post! No telling when I’ll get a chance to write another post, so I figured I’d better make this one count. At least you can get an idea of what each day of the week is holding here at Wild Ozark, anyway. Fill me in on your doings!